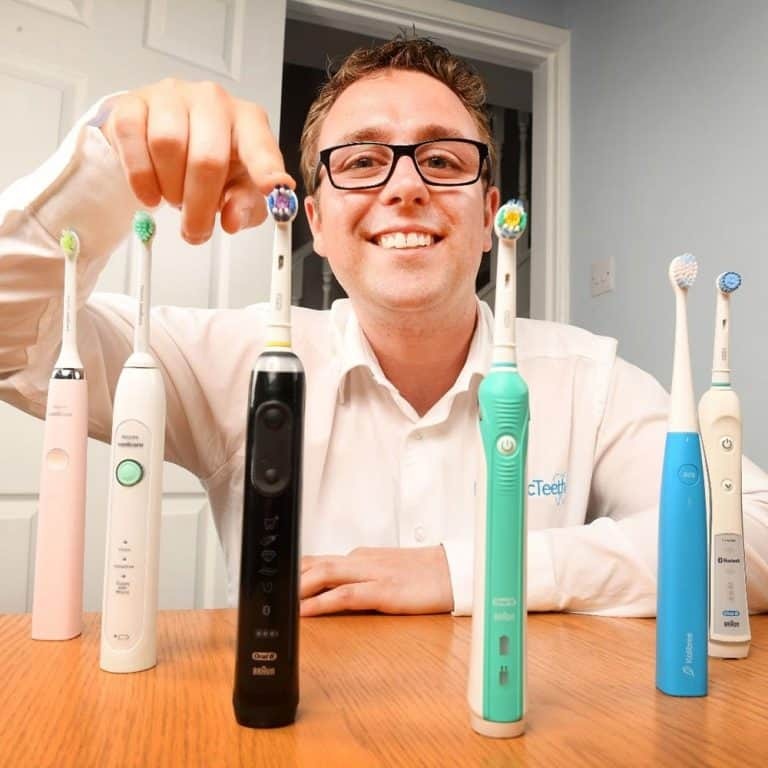 In 2017 Oral-B launched the Pro 3 3000 and the Smart 4 4000, essentially replacing the models compared here. We have compared these new models in our Oral-B Pro 3 3000 vs Smart 4 4000 post. Here is our comparison table for the newer models, and we also include the original 3000 vs 4000 comparison below. As with all of our electric toothbrush comparisons, we give you the short answer first, and then go on to explain it in detail. In this post we’re considering two of Oral-B’s mid-range brushes: the Oral-B Pro 3000 vs 4000. Read on to find out which is the better choice. It is more expensive (at the time of writing) but offers an additional cleaning mode, brush head and convenient storage compartment for the brush heads. Thus, the Pro 4000 is our choice of the two as it suits the needs of more people. The Pro 4000 comes with an additional cleaning mode (whitening) over the Pro 3000. The Pro 4000 comes with an additional cleaning head (3D White) included in the box. Detailed Comparison: What’s the difference between the Oral-B Pro 3000 and Pro 4000? Sat side by side there is only one way to tell the difference, unless you can see the box contents, and that is by the colour of the rubber band that is on the front of the brush. The 3000’s rubber gripped handle is blue as is the 4000, but the 4000 is much darker, a Royal Blue even. As a result of the similarities they share a lot of features; the Pro 4000 is essentially an upgraded 3000. Both are slim and comfortable to hold in the hand with a gloss white plastic body to the rear and the rubber strip that runs down the face of the brush handle which makes the brush look smart and offers additional grip. The size and weight makes these brushes suitable for older children with smaller hands right through to seniors with less movement in the hand. A standard 2 year warranty is provided, but this can be extended to 3 years, if you register the brush online. Where some differences start to creep in are with the box contents. The Pro 3000 comes with 2 brush heads, a CrossAction and Sensitive as well as a charging stand, and a moulded holder that clips to the charging stand and offers 2 prongs for the included brush heads to sit on. The Pro 4000 does away with the 2 pronged holder and offers a neater compartment/tray that holds up to 4 heads and has a nice lid to cover the heads when stowed away. Also included with the 4000 is an additional 3D White brush head. Neither come with a Wireless SmartGuide as you get with the more premium Pro 5000, 6000 and 6500. No travel case is included either, if you want one of these, then you will have to purchase this separately. Both do offer a feature which is not well marketed by Oral-B, and that is ‘Sound Connectivity’. Essentially an app on your Android or iOS smartphone listens out for the sound of the active brush and logs your clean as a result. It isn’t perfect but it is an interesting and possibly useful feature for you. You can read more on that here. We are comparing toothbrushes here so it is only right to talk about their cleaning modes and how well they do this. Both come with Daily Clean, Gum Care and Sensitive whilst the 4000 benefits from Whitening mode too. The different modes are best used with different brush heads, which thankfully come included in the box. You can if you like, use any of the brush heads on any of the different cleaning modes, but the 3D White works best with the Whitening mode as the Sensitive brush head works best on the sensitive mode. You can read more here about how the different cleaning modes on these brushes actually compare, but essentially each cleaning modes uses a different number of pulsations and oscillations to more effectively clean the teeth and gums in conjunction with the appropriate brush head. If you have not used an electric toothbrush before and considering these Pro series electric brushes, you can be assured of more plaque removal and a generally healthier and cleaner set of teeth as a result. However, this is in part affected by how you clean your teeth, you need the right technique as even the best brush is useless without it. So if changing, why not make changes to your brushing technique to make sure you are doing the job right? If the above question was one better at whitening your teeth than the other the answer would be yes. The Pro 4000 has a Whitening mode and a 3D White brush head in the box which together help to remove stains from the surfaces of your teeth. They share 3 cleaning modes, Daily Clean, Gum Care and Sensitivity, all of which clean the same. Whilst the Pro 3000 cannot have the Whitening mode added, you can change the brush head to a 3D White and use it on the Daily Clean mode and it will have some impact for those with more heavily stained teeth. When we reviewed the Pro 4000 we gave it a rating of 4. The same rating was given to the Pro 3000 in our Pro 3000 review. Generally speaking, the Pro 3000 is the cheaper of the two brushes. At the time of writing the Pro 4000 is available for about £55* and works out at about 8p per day whilst the Pro 3000 is £45*(but can be obtained for as little as £34), at costs 7p per day over a 3 year period. Both of these brushes offer something for someone. The particular cleaning modes may appeal to you to make one or the other more suitable. The slightly frustrating thing is that, the Pro 3000 and 4000 sit in the middle of a range of brushes. The cheaper Pro 600 and 2000 are better suited if you want an electric brush with just 1 or 2 modes, whilst in our opinion, the more expensive Pro 6000 offers more and works out more cost effective if you really desire or need additional cleaning modes or plan to use with multiple users where everyone’s needs are different. The entry level and premium brushes just offer more all round ‘value’ than the 3000 and 4000 that site in the middle of the range. Either brush is available from a wide array out stores from high street pharmacists to online retailers, the prices of these brushes can vary considerably. Typically there is about £10-25 difference between the two. This was so useful and I have made my choice I am going for the 3000. Hi Jill. Really pleased to hear that you found it useful. Which brush have you decided upon and why?